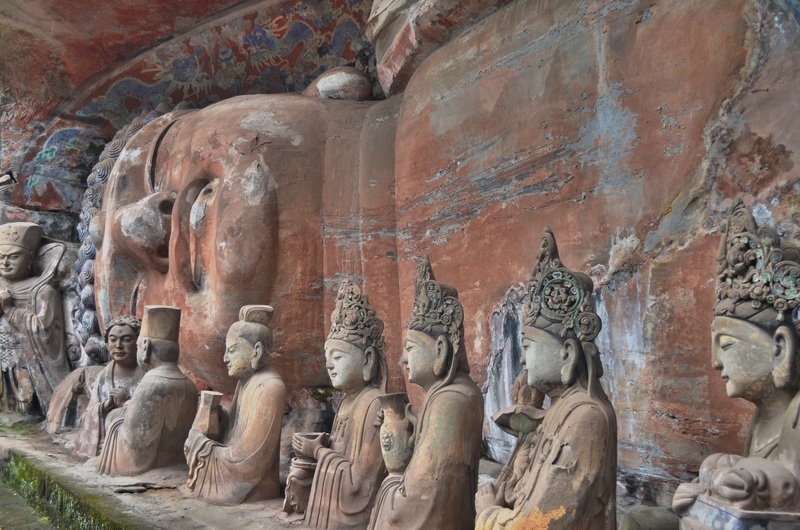 The passing of the Buddha, Dazu Rock Carvings 大足石刻, China, circa 2011. Photo Peter Romaskiewicz. In the waves of interest over “flipped classrooms” I feel that lecturing gets unfairly vilified. I am not the only one to feel this way. Sure, dry presentations are not the best way to transfer information and there are plenty of more dynamic strategies to get students actively learning. But I still feel lecturing has some merits and I want to share some thoughts on how I plan lectures – yes, plain no-frills lectures – specifically where I am dominating speaking for over the magical fifteen to twenty-minute threshold. Perhaps the most critical element to my “plain lectures” is the incorporation of narrative elements, especially conflict (and possibly, resolution). Not that long ago Pixar released a series of free lessons called The Art of Storytelling. The short video introducing the topic of story structure poses this very interesting question: “What do you want the audience to know and when?” This is something I keep in mind when developing lectures because I want to build suspense, or at the very least, slowly lead to a problem that requires a solution. I’ve developed two types of lectures along these lines: One I’ll call the Basic Story Lecture and the other I’ll call Critical Modeling Lecture. These are really ideal types; more typically these form smaller components of more dynamic lesson plans that involve discussion, class exercises or group activities, etc. – the token activities of the flipped classroom. The Basic Story Lecture is simply that, a good basic story. It has characters, a setting, a plot, a climax, and so forth. Religious studies is ripe with good stories and so is the history of religious studies scholarship (think about archaeological and textual discoveries that had revolutionized different sub-fields). For example, I’ve created a lecture to introduce Buddhism through the life story of the Buddha – a natural fit for the Basic Story class – and I will outline how I developed this class below. Shorter lectures I’ve developed that fit naturally into this mold are the life story of Mahāvīra (Jainism), Bodhidharma (Chan/Zen), and Huineng (Chan/Zen). The Critical Modeling Lecture requires me to pit two or more scholars against one another. I introduce a topic, or more specifically, a scholarly question that begs for a solution, and lay out the process by which one scholar attempted to solve it. Often this will be the required reading for the class and invariably this stirs up some discussion or clarifying questions from the students. I introduce conflict by explaining a competing scholarly theory that the students were (likely) not aware of. Its nice when this theory is based on recent discoveries, like archaeological finds or newly discovered texts. I then lay out this new theory. Or, I may give my personal interpretation of the evidence, offering critiques of the conclusions, highlight assumptions, problematizing evidence, etc. In other words I model the critique process. This lecture will usually end with a discussion asking the students which theory they find more convincing. To return to the Basic Story model, last week I was able to give my lecture on the life of the Buddha. It’s probably the fifth or sixth time I’ve given the full lecture with this model in mind and I’ve come to really enjoy it. Set-up: I begin the class with a provocative statement; I tell the students that the entire lecture is a fabrication. No scholar believes the existing life story of the Buddha to be historical fact; it was all cobbled together several centuries after the demise of the Buddha. I then ask, if this story is a complete myth, should any of it be important? Why should we care about it? Ultimately I try to bring class discussion to this point (made nicely by John McRae): It’s not true, and therefore it’s more important. This typically ruffles some feather. Myths tell us about idealized visions of humanity; they reveal assumed cultural and religious values. Thus, the life story of the Buddha reveals important Buddhist values and hints at its central doctrines. I direct the students, as I tell the story, to try to tease out which values Buddhists find most significant and which episodes potentially reflect typical doctrinal viewpoints. Practice: I then detail the life story of the Buddha using slides to compliment my narrative. Each slide has minimal wording, with mostly names and locations in captions to the images. If I have not been able to find an image depicting an event in the story of the Buddha I do not describe that event. I make it clear that artisans helped to craft the story of the Buddha by depicting only certain life events. (In practice, much of what I’ve read has actually been depicted in art at some time but I will mention a few examples.) This also allow me to break down the images, talking about symbolism, visual narration (synchronic and diachronic modes), and artistic conventions. I try to build the climax around the Buddha’s early ascetic practices and also around his battle with Māra. Overall the story of the Buddha (starting from an ascetic bowing before Dīpankara Buddha to relic worship at stūpas – taking John Strong’s approach that the biography of the Buddha continued after his death) takes me between 40 minutes to 1 hour, depending on speed and detail. I’ll take questions during the story, but rarely do I allow them to lead to extended discussion. If necessary, I’ll tell student to make notes for later. I hold off discussion to the end of class when I ask which elements of the story stuck out the most; where were the students the most surprised, shocked, or curious. (I have a slide that shows an outline of 20 different story elements to jog their memory). The Buddha leaving his son and wife often gets mentioned, as does his severe ascetic practices (there are many beautiful, if not haunting, images of this episode), as well as his performance of numerous miracles (while textbooks often overlook these episodes, the art historical record is quite rich). The final discussion transitions to which values are presented as most significant through this story. Renunciation and the overcoming of desire and the realities of the suffering of life are commonly highlighted themes. For those familiar with basic Buddhist doctrine (or who did the reading), they may point out the connections to the Four Noble Truths or the seal of impermanence. Outcome: With about twenty minutes of discussion at the end, I can squeeze this class into an 80 minute session. And while bookended by class discussion, the “meat” of this class is straight lecture, or in this case, storytelling. UPDATE II: I ran across this article which specifically talks about lecturing in the humanities. UPDATE III: More insight on this issue here.